New free pattern: Mitt-o-matic…it’s interactive! Mitt-o-matic is my first ever interactive knitting pattern. It’s an idea I’ve been thinking about for some time and a simple enough concept; enter a few measurements into a web form, some maths is done behind the scenes, et voila! A personalised knitting pattern for a custom-fitted garment is generated. 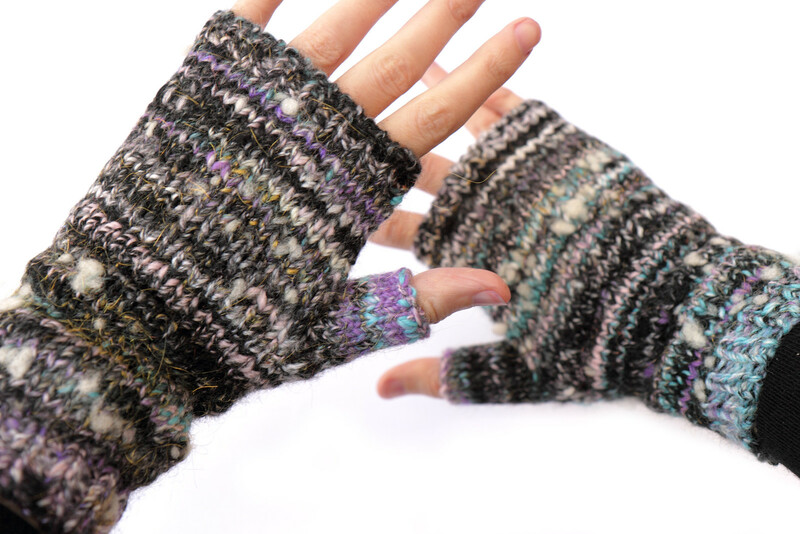 I needed a simple garment to try out the idea with…I love fingerless mittens and I normally knit them as simple stockinette tube with an ‘afterthought’ thumb and a little ribbing at each end. I have many odd skeins of handspun and hand-dyed yarn that call for a clean design with minimal embellishment to show them off. Although a basic construction with no shaping, there are several variables that mitten design requires to be considered: How much negative or positive ease should they have? How many thumb stitches do they need? How long should the cuff be? Mitt-o-matic takes just two measurements to calculate a perfect fit. Understanding how these should be calculated took a lot of test knitting. 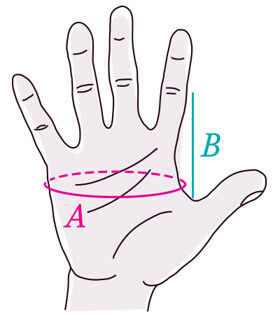 The pattern instructions and formulae were refined over a number of weeks until I was confident that I could generate a well-fitting mitten with just two straight-forward hand measurements, which tell the app about the wearer’s hand shape and size. Being able to generate custom-fitted mittens is wonderful, but lots of people knit mittens as gifts and might not be able to measure the wearer’s hand. So, just like a traditional pattern, there are some useful size presents. I couldn’t find much information online about standard hand sizing so I crowd-sourced the information by conducting a survey (unfortunately I didn’t get back any children’s hand measurements so I couldn’t provide presets for children, but I would love to in the future). If you’re using a pre-set size, quite unlike a traditional pattern, you see only the measurements and counts for the version you’re following! Having tackled sizing, I decided to add another dimension of the complexity; tension/gauge. I was inspired to work on mitt-o-matic by my love of knitting simple garments with handspun yarn that might not match a standard yarn weight, so it had to work with any tension. My test knitting had taught me that a tighter-than-usual tension made for cosier fingerless mittens. I added standard yarn weight presets to save time for knitters using commercial yarn (they also work with It’s a Stitch Up Favourite Sock, Awesome Aran and Marshmallow Cloud Baby Alpaca Chunky). Whatever your yarn, however loosely or tightly you knit, you can generate a pattern just for you. With all of the calculations done, designing the user interface came next, which in many ways was the most difficult part of the project (even though this is what I do for a living). It’s surprisingly difficult to make a form involving lots of numbers and settings look inviting, rather than intimidating. It’s equally difficult to predict how users might expect the buttons and interactions to behave. It was great to have feedback from friends at this point, especially Alice, who helped me fine-tune the interface and make it easier to use. I would love to have your feedback about Mitt-o-matic. I already have plans for Hat-o-matic and Scarf-o-matic so let me know what you think! You can leave your comments here, on the pattern or in the It’s a Stitch Up Ravelry Group. 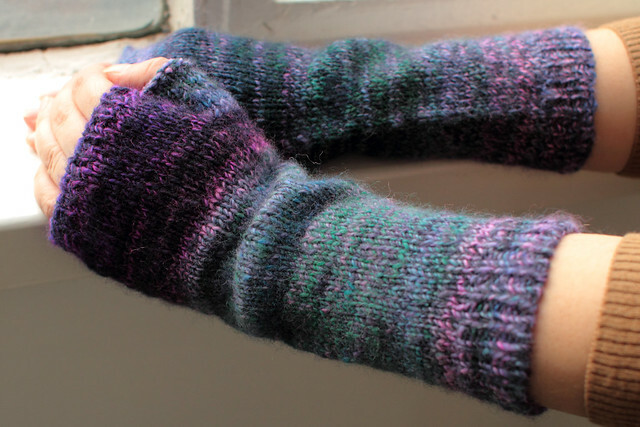 I am so inspired by your creations, especially projects that I happily knit all the time….fingerless mitts and hats.